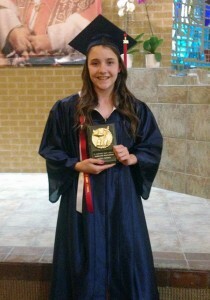 St. Margaret Mary graduates consistently score high at higher levels of education. See the Marian Central Catholic High School press release announcing students who scored a 30 or higher on the ACT. Less than 5% of students score above a 30. Congratulations to the six Saint Margaret Mary graduates who are a part of this distinctive group! Click this link to view the Marian Awards. Since 2008, there have been 8 Alums who have become High School Valedictorians! The primary purpose of these tests is to provide information that can be used to improve instruction. This information is valuable to the extent that it contributes to making better instructional decisions that could not make without having that information available. Standardized test scores cannot and should not replace teacher observation and classroom assessment information. They can provide unique supplementary information that helps to make decisions about selective learning objectives, choosing instructional material, and creating an effective learning environment. The scores make it possible to determine areas of relative strength and weakness and stimulate year to year growth. These scores also allow us to look at the achievement levels of our students in relation to other students in the nation. Tests are given in early fall each year to students in grades 3-8. 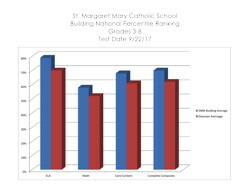 The graph below shows St. Margaret Mary School’s 3rd-8th grade students average at least 1 ½ grade levels above the national average in each academic subject area tested. 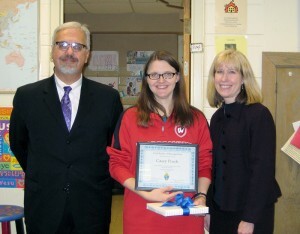 Our Graduates do very well at both local public high schools and Catholic high schools. Our teachers do an excellent job of building up our students’ academic skills throughout their grade school years. This year’s 8th grade class ranked in the top 6% as compared to other schools in each of the areas shown on the ITBS graph above.